After Apple's iTunes Music Store debuted on April 28, 2003, sales of 99-cent digital singles surged. But that had a disastrous impact on overall music revenue. Believe it or not, Apple's iTunes Music Store turns 10 this weekend. Although iTunes has in many ways been a godsend to fans of digital music, it has been a source of endless frustration for the music industry. Since the introduction the iTunes Music Store on April 28, 2003, music sales have plummeted in the United States -- from $11.8 billion in 2003 to $7.1 billion last year, according to the Recording Industry Association of America. When adjusted for inflation, revenue has been more than halved since Apple (AAPL) launched the iTunes Music Store. 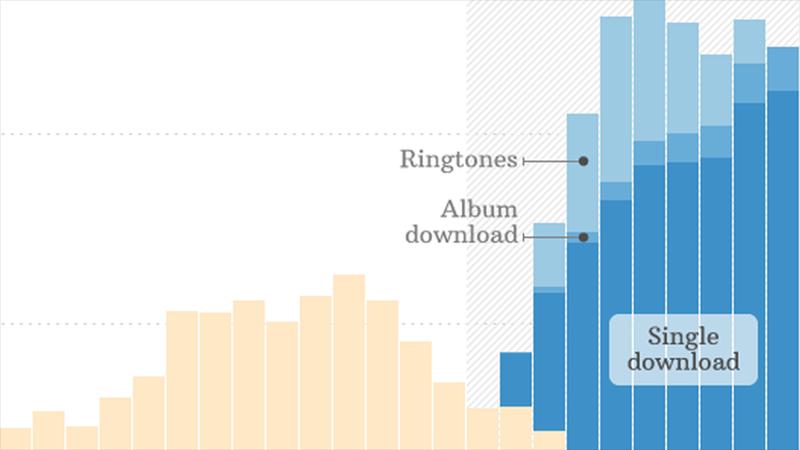 Interestingly, during that same time, people have been buying more music than ever. How is that possible? It's because the iTunes Music Store popularized the cheap digital single. After manhandling the major record labels during a series of now-legendary negotiations, then-Apple CEO Steve Jobs was able to initially offer digital albums for $10 and any individual track off that album for 99 cents. That changed the music industry forever. When music sales reached their peak in 2000, Americans bought 943 million CD albums, and digital sales weren't even a blip on the radar. By 2007, however, those inexpensive digital singles overtook CDs -- by a wide margin -- generating 819 million sales to just 500 million for the CD. Last year, there were 1.4 billion digital singles sold, dwarfing CD sales by a factor of 7. More than three-quarters of all music-related transactions were digital singles last year, according to the RIAA. Apple's iTunes is behind that sea change. According to NPD estimates, iTunes is currently responsible for 63% of all digital music sales. Even after the emergence of competition from Amazon and Google. The popularity and ease of downloading cheap digital singles has transformed the industry. Not since the vinyl era has the single been this popular. The smaller, cheaper "45" record dominated music in the 1950s and '60s, but the music industry wised up in the '70s. Vinyl, cassette and CD singles were always cheaper for consumers, but manufacturing costs were not. Nor was the space required to house them in stores. Thus, the single became harder and harder to come by. The reality is if singles were as available a decade ago as they are now, they would have been just as popular. Music nerds notwithstanding, the average music listener has really only cared about a few tracks off an album at most. So how was it that the iTunes Music Store, with its proprietary file format and limited device support, that led this charge? By the time the iTunes Music Store arrived, the iPod was well on its way to becoming a run away success, which meant that Apple already had an installed base of customers using iTunes. Competitors, such as Rhapsody, were mostly concerned with streaming music. Most crucially, their files weren't designed for use on the iPod, let alone most other MP3 players. Without the iPod, iTunes and its music store were seemingly innocuous. But the magical combination of buying a song instantly and taking it with you anywhere gave music lovers a good reason to ditch the CD. Can music sales ever come back? Likely not, says NPD analyst Russ Crupnick. He believes musicians will have to increasingly rely on touring, merchandise sales and endorsement deals to make up for lost album sales. The subscription streaming services of Spotify and other music apps could help bolster the business, Crupnick says, but the thought of those bringing the industry back to its former peak seems lofty. Ironically, it could be Apple that is in danger of losing its grip on the music business. Whether or not Apple can maintain its relevance in digital music could very well depend on its ability to transition to the streaming subscription model, which is rapidly adding users. Nevertheless, the iTunes Music Store's effect on the way people buy music over the past 10 years has ensured that the music industry will never again be the same.